I vow to finish this series no matter what it takes, even if it kills me. The first Death Wish film, at this point, feels quite dated but it still presents the viewer with interesting points of discussion and some memorable sequences. Everything after that just got progressively worse to the point of being brainless and downright silly. Let’s see if that progression, or regression in this case, continues with the last two films in the series. in 1987, Death Wish 4: The Crackdown was released, but this time Michael Winner was out of the director’s chair and replaced by J. Lee Thompson. Paul Kersey (Charles Bronson), an architect by day and vigilante killer by night, seems to have finally found a place for himself with his girlfriend, Karen (Kay Lenz), and her daughter, Erica (Dana Barron). This stability is shaken to the core when Erica dies of a crack overdose one night, which angers Kersey to the point of once again picking up his weapons and cleaning up the mean streets of Los Angeles. Before he gets very far, Kersey is contacted by magazine publisher Nathan White (John P. Ryan) who tells Kersey that his own daughter died of a crack overdose and puts him on the trail of two big time rival drug dealers. Kersey now has a larger plan of action schemes to pit the two factions against each other while systematically wiping out their business on the streets. 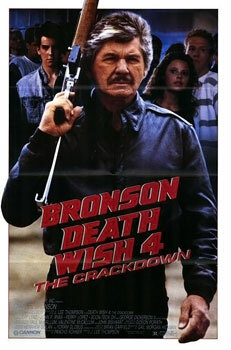 I can believe I’m saying this, but Death Wish 4: The Crackdown may very well be the best sequel in this series so far. That isn’t really saying too much, but it at least keeps things minimally interesting. It’s still, at its core, the same exact thing. Someone close to Kersey dies so he goes on a revenge spree until he finds his way to the person truly responsible. It’s the formula for this series that has grown so old at this point. What this film does differently is show Kersey going against to warring factions and making them suspicious of each other, which at least adds a newer level that wasn’t in the other films. The unfortunate thing is that this doesn’t really amount to a whole lot in the grand scheme of things, and the effects that he has on them is over before you can fully appreciate what it is he’s doing. It was still nice to at least see the film makers trying something different with the material. Death Wish 4 is still lacking in areas that the other films were, despite there being some improvements to the formulaic nature the series found itself in. For one thing, this film is still completely devoid of any emotional resonance which is garbage considering this is a revenge film. If you’re going to make a movie where a character feels the need to get revenge on someone, there should be some feeling expressed by the character. Instead, someone dies and Kersey kills people because that’s what it says in the screenplay, not because that’s what he feels he has to do. It’s so routine, and Bronson just looks like he’s going through the motions. It’s a very robotic feeling movie. Nothing happens because the characters feel this is what should happen next. Everything happens because that’s the way to move the story forward. That doesn’t make for good entertainment and that’s not the way a story should be written. Death Wish 4: The Crackdown is a slight improvement over Death Wish 3, but not by a whole lot. It introduces some new concepts, which is fine, but doesn’t really go anywhere with them. The whole film just feels part of the same routine that other movies have already established. It also has one of the worst scenes involving a dummy I’ve ever seen, which can also be said about Death Wish 3. This isn’t a good action movie, but it isn’t the worst this series has to offer. I still found myself wishing I was just watching something else. As if 4 movies just wasn’t enough, a fifth and final movie was released in 1994. God help us all. Paul Kersey, now living in New York City under the name Paul Stewart, has been madly in love with fashion designer Olivia Regent (Lesley-Anne Down) and has recently proposed to her. He also cares deeply for Olivia’s daughter, Chelsea (Erica Lancaster), who sees Kersey as a father figure. This happiness Kersey has found soon comes crashing down when Olivia’s gangster ex-husband, Tommy O’Shea, (Michael Parks) moves in on her business and eventually ends up disfiguring and killing her. This forces Kersey to once again pick up his weapons and bring real street justice to this band of criminals before they have the chance to hurt anyone else. I really hate saying this, but I am so sick of writing about these movies. They wore out their welcome long ago, yet here I am commenting on another Death Wish film. 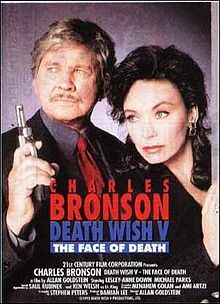 Death Wish V: The Face of Death has few positives working for it. For one thing, Kersey has some interesting methods of killing people, and it sometimes borders into dark comedy territory. I also really enjoyed the villains in this movie, and they are much more memorable than any of the other antagonists this series had to offer. Michael Parks really hams it up as Tommy O’Shea and he comes of as slimy and down right villainous. I at least really wanted to see Kersey get his revenge on him and it works well. There’s also a really interesting character played by Robert Joy that is quite unique, but he’s never really touched upon except in a few very brief scenes. Everything else about this movie is recycled, and I honestly don’t have too much to say about it. It’s all the same formula. Someone hurts one of Kersey’s loved ones and so he, in turn, kills them. It’s the same exact thing over and over again, and by this point it’s tired. Bronson, himself, seems bored out of his mind and this is obviously just a paycheck for him at this point. There’s nothing exciting about anything in this movie except for the end credits because I knew that it was at this point I was done with these movies. I don’t have anything more to say about Death Wish V: The Face of Death that I haven’t already said for the other 4 movies in this series, especially concerning the sequels. This is a pretty boring movie that plays by the formula that it dares not change. There are only a few redeeming qualities, but it doesn’t really help that much. The Death Wish series really didn’t have a whole lot of steam to start with, so the fact that there are 5 movies is really an anomaly of film. I will admit that it’s fun seeing Charles Bronson do what he does best, but there really isn’t much else worth while in these movies. I hate to use this term when it comes to movies, but this series is a prime example of cinematic garbage.